Earn 49 points to spend on future purchases. 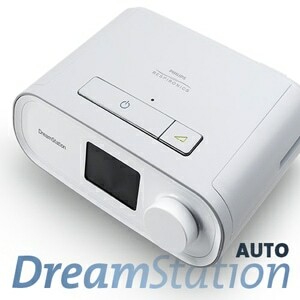 The OptiLife CPAP Mask features a unique headgear design and a chin support band that allows it to be easily put on and adjusted with little effort  and no buckles. In fact, OptiLife is so easy-to-use that the mask can be put into place with one hand. Plus, OptiLife is easy-to-clean and maintain, and it’s durable enough to stand up to the real-world demands of daily use. 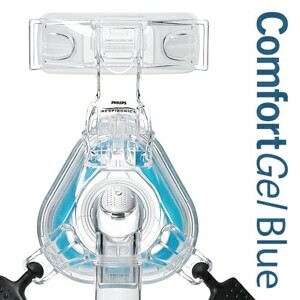 This updated OptiLife Mask Pack includes flexible adapter tubing, to connect to your main CPAP breathing tube, so OptiLife stays secure, without pulling or dragging, even for active sleepers..
OptiLife Masks are compatible with two great interfaces -- nasal pillows and direct seal cushions. OptiLife Nasal Pillows provide a highly contoured pillow interface that fits comfortably into the nostrils for an easy, leak-free seal. Four sizes are available to fit a wide range of users: Petite, Small, Medium, and Large. OptiLife Cradle Cushions offer a non-invasive direct seal interface that includes a generous landing area and deep arc for excellent comfort and seal. Four sizes are available to fit a wide range of users: Small, Medium, Large and LargeNarrow. This mask pack does not include Cradle Cushions; but OptiLife Mask Packs with Cradle Cushions are available separately on this site. OptiLife has soft headgear straps on the cheek so it's great for side sleepers, and it has NO BUCKLES on so it's easy to adjust and won't cause sore spots. With its low profile frame (great for watching TV or reading), quiet operation, comfortable nasal pillows, unique chin support, and a host of other friendly features the OptiLife is sure to be a winner for you. I could not get it to hold my mouth closed and it was a bit noisy! Nice mask when properly adjusted and worn. All good, no problems. Have been wearing this style for several years. Exactly what I needed. The dog ate my mask and I was afraid I wouldn’t be able to find a replacement. Fast shipping too! The mask is very comfortable but it lets to much air out of the little holes. I will probably go back to using my other mask. OptiLife Nasal Pillow/Headgear system with a chinstrap works best for me. Have tried other "pillow" makes/models but none work as well as the OptiLife. I ordered a new mask with accessories. The order was received very quickly and needed no further adjustments. 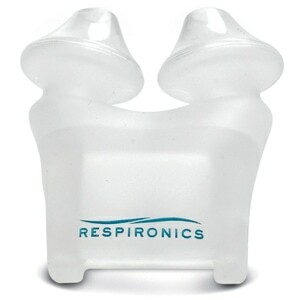 I am very pleased with the quality of the mask and the service of Home Medical. I would give it 5 stars on the reduced headgear footprint, and the built in chin strap. Unfortunately, it produced an intense burning sensation just inside my nostrils, and I couldn't even get throu an hour of wearing it, for the pain. I tried 3-4 times wo lie down and sleep with it, and I just could not get it to stop hurting so I wrote it off as a fail. I have used this mask for several years. It works well for me. I am a side sleeper. It stays in place fairly well but not perfect. The headgear tends to slide up on back of my head. The drawback is that there is a good bit of the frame in front of your face. The chin strap helps it stay in place. The pillows are flexible enough to align and stay sealed with slight movement. I tried the Golife mask due to its smaller size, but pillows were stiff, wouldn't align well to my nose, and had to be very tight to seal. Optilfie works much better on me. Very good products, factory fresh, at a very low price and shipped very quickly. I'm a happy customer! I bought nasal pillow kit for my CAPA. It was the first time I tried this one, I had always used a full nasal mask. I find the fit to be great and the comfort is outstanding. I highly recommend.The prices are great too. I got this mask thing it would be perfect for me. I am sad to say it is not. I wanted a mask that had a chin strap since I grind my teeth at night. The strap does not tighten as much as I would have hoped it would. I use the small nose piece but that seems a little uncomfortable. The headhear is terrible. 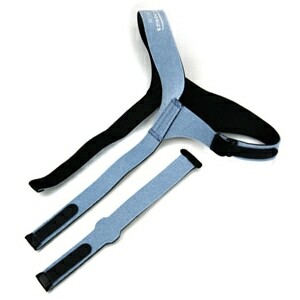 It straps up both cheeks to the top of the head and then under the chin. I was hoping for less marking on my face while using this one, but that was not the case.